Copenhagen is making a guest appearence in Madrid these days. There is an exhibition at the Circulo de Bellas Artes called Miradas de Europa, which is translated on the website as Looking on Europe. Sponsored by the EU and the City of Madrid. "A visual journey around the European Union as seen through the eyes of its photographers, this is an exhibition about tradition and local customs, historical places and events relevant to each culture, bringing us closer to a reality which is near at hand and yet largely unknown." 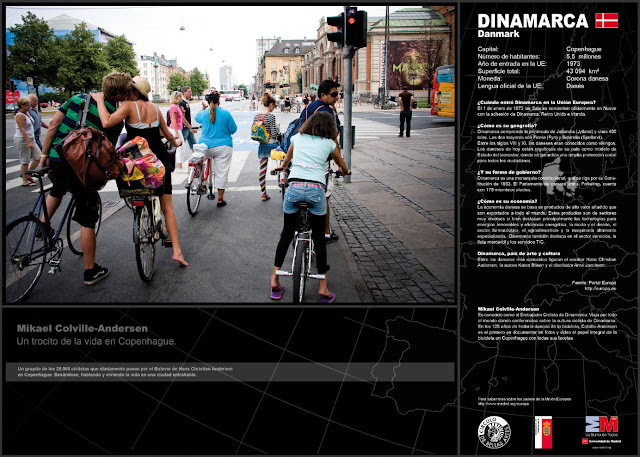 One photo from each of the 27 European Union countries is presented and a photo of mine is representing Denmark. Which is flattering and humbling. Thanks to the Royal Danish Embassy in Madrid. For the next month, at least, there is some separated bicycle infrastructure in Madrid... and more is on the way. C/ Marqués de Casa Riera 2, Madrid.